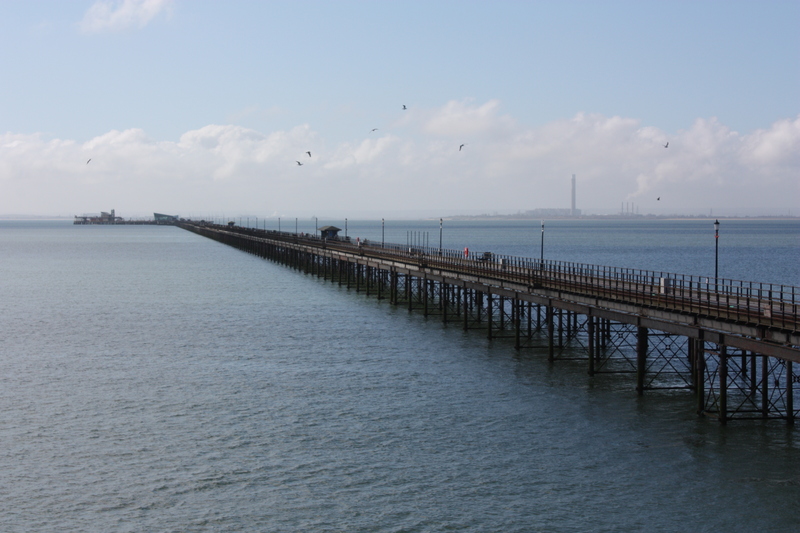 A lone fisherman and I were the only passengers on the first train of the day to clatter its way up Southend Pier. On the way I read a poster about “the longest pier in the world” (1.3 miles) and began to doubt the wisdom of starting my walk at the wet end. But it is a good marker and it did feel like I was standing where river and sea meet. At 9am I tightened my bootlaces and headed back towards dry land. 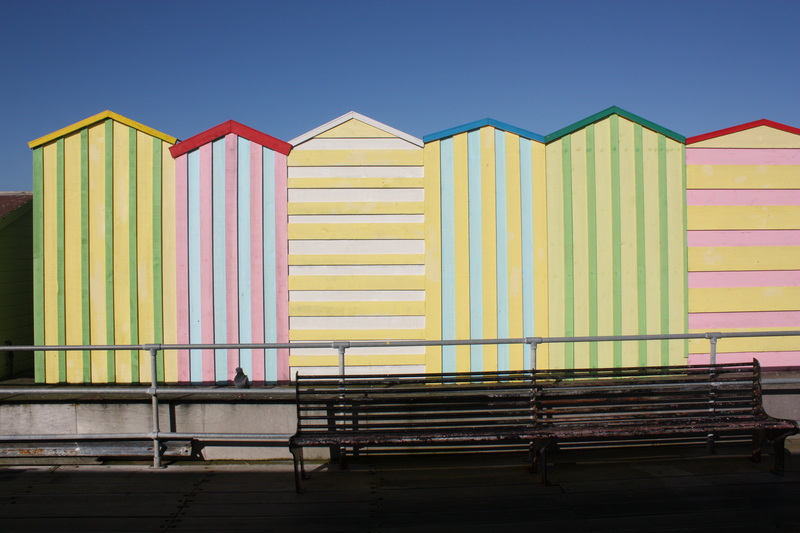 When I had left home three hours earlier it had been cold, frosty even, but as I walked west along the seafront the sun was out and the temperature was fighting its way upwards. The promenade was becoming busy with walkers, dog-walkers, joggers and cyclists. Human-kind had shed its winter woollies and and come, clad in lycra, blinking into the spring sunshine. Some smiled. Some even said “good morning”. One exclaimed “Incredible! It’s not raining OR snowing!”. People were sitting outside cafes and for once the ice cream vendors didn’t appear ridiculously over-optimistic. This was the first leg of my project to walk from Southend to the source of the Thames.I like to think I know myself quite well, and I know that if I decide to prepare for something the preparation will take forever and I will never get around to doing the thing I’m preparing for. And, if I want someone to come and do it with me we will never be able to co-ordinate diaries. So on this occasion I set my alarm for stupid-o’clock, started walking and hoped that I would make it through the day. 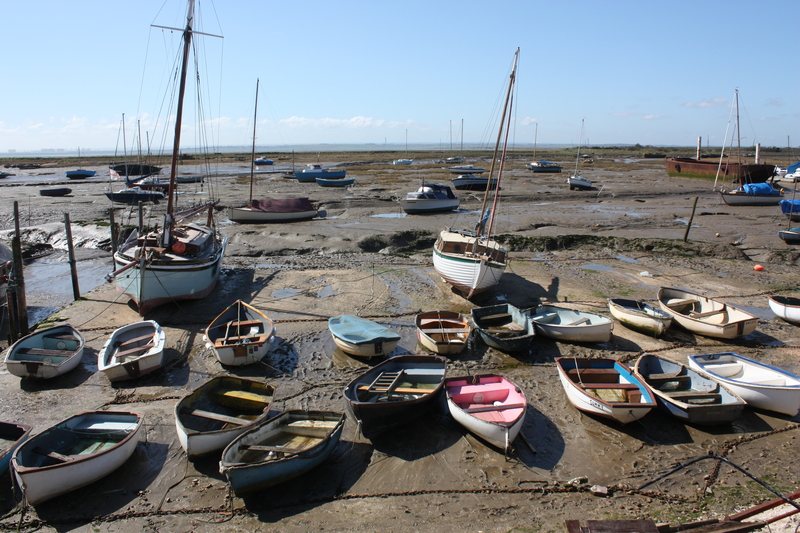 A few miles from Southend I came to Leigh-On-Sea, which has quite an attractive quay and I stopped here for a sandwich. On other walking expeditions I have come a cropper as a result of failing to eat. Eating is not normally a problem in my day-to-day life but I have been told by others that when walking – even though you have to stop to do it – it is important to eat. Apparently doing so has a beneficial effect on energy levels. And so it seems. Re-energised, I walked on past a pub called “Ye Olde Smack” – which suggests that drugs are not necessarily a recent problem – and then past a series of “Cockle sheds” housing a lot of seafood businesses, which looked worthy of a visit although almost all were shut at that time in the morning. At Benfleet the path, road and railway converge and here I could take the bridge over Benfleet Creek and onto Canvey Island. I’m not normally one for stereotypes, but as I crossed onto Canvey Island the first group of people I saw was a gaggle of shouty she-chavs. The first dogs I saw were two massive German Shepherds, and the first car was an Impreza with a loud exhaust. But the islanders turned out to be charming. “Good morning” gave way to “Alright?”, sometimes appended with “Mate”, but cheerily delivered. 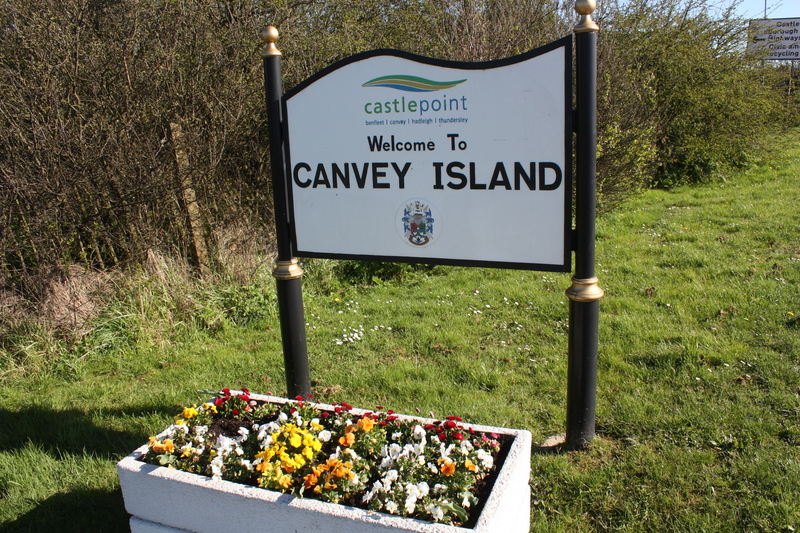 Canvey is a reclaimed island. I think they should have reclaimed a bit more because it sits only just above sea level and has therefore had to be surrounded by flood defences. To the north of the island this consists of earthworks, but the rest of the island is protected by an ugly grey concrete wall about 5ft high on top of an already elevated bank. Some of the newer homes near the coast are big 3-story houses with living space and balconies on the top floor, this being the only way of getting a sea-view over the barrier. All of this is the legacy of the disastrous North Sea flood of 1953, which due to a combination of factors led to a sea level as much as 18ft above the norm and which affected areas from Scotland, to Essex, to the Netherlands. 58 Canvey islanders lost their lives in that flood. The Netherlands suffered much greater loss of life and even those on boats were not spared; a ferry was lost as were numerous trawlers. This single event was largely responsible for the flood defences that were to be a feature of my walk all the way into London. Turning left to walk down the east side of the island, skirting the golf course, it was somewhat dispiriting to see Southend Pier directly in front of me and to know that I was going to walk several miles back towards it. That’s the trouble with tributaries. The golf course gave way to houses, the houses in turn gave way to the neatest mobile-home park I’ve ever seen, and then a country park which at last allowed me to turn my back on the pier and head back to the Thames proper. At the country park, I noted that I had been walking for four hours but, as the crow flies, I was only four and a half miles from my starting point. 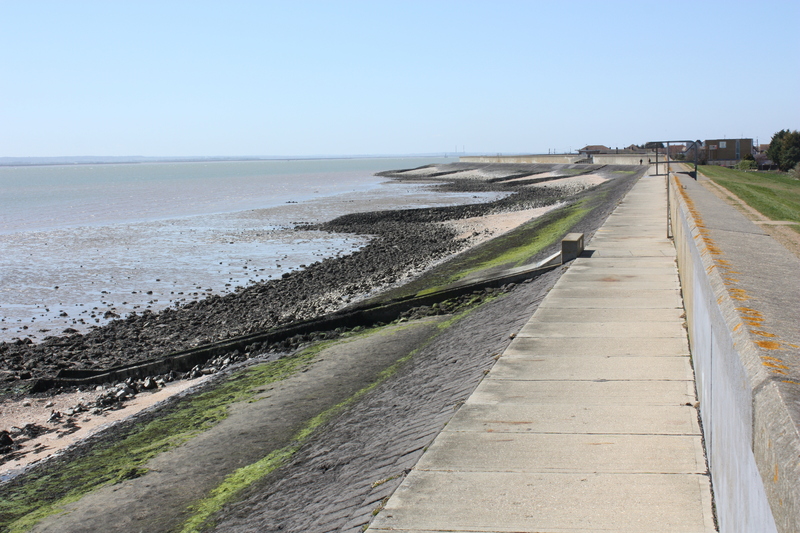 Along Canvey’s seafront I walked on the “seaward” side of the defensive wall. It seems surprising that Canvey was once a popular “seaside” destination for eastenders. It wasn’t that easy to access (still isn’t), the beaches are small and made up of rather coarse gravelly sand, and there’s only a short strip of sand before you get to the dark Thames mud. And, let’s face it, Southend is only a few miles down the road. At Deadman’s Point the landscape changed from seafront houses, amusement arcades and so on, to oil storage depot. Not actually as dominant over the island as I had expected, having recently watched “Oil City Confidential” the story of Dr Feelgood. 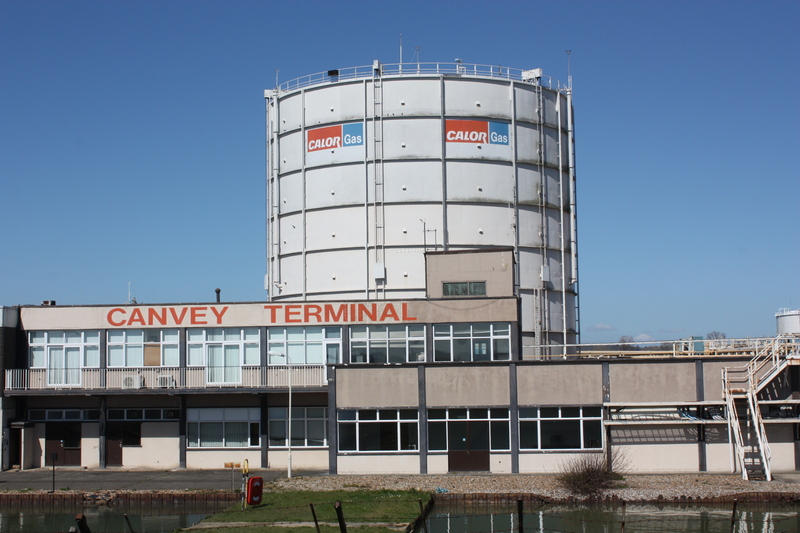 (If you like a bit of R&B, that’s proper R&B not the rubbish that the kids of today call R&B, “Oil City Confidential” is recommended viewing) In fact the Canvey Terminal is dwarfed by the depot on the other side of Holehaven Creek – but still not attractive. And eerily quiet; I only saw one person (wearing a West Ham shirt) inside the depot and yet the car park was packed. Where on earth were all those people? At the end of the depot was an attractive and tempting pub, “The Lobster Smack”, which suggests that even the seafood has a drug problem. Googling it now I see the pub dates from the 17th century and featured in Great Expectations (I don’t believe the oil depot got a mention in the book). The pub spoke to me but I had walking to do and I pressed on, leaving the Thames behind and heading up the tributary of Holehaven Creek. To my left on the other side of the creek I still had the refinery. But on my right I had open countryside. To begin with I was accompanied by a group of dog walkers, but they fell behind and eventually disappeared from sight, and for the rest of the walk I was alone. This part of the walk was uneventful until I eventually reached the flood barrier at East Haven Creek. Something I had been unaware of until I started planning this escapade was that, apart from the famous Thames barrier, there are a number of older, smaller barriers even on small creeks like this. Crossing the creek at this point was fundamental to my route, taking me back to Pitsea, where I had left the car, in under three miles. The map shows a track crossing the creek at the barrier. Google Earth shows a track crossing the creek at the barrier. 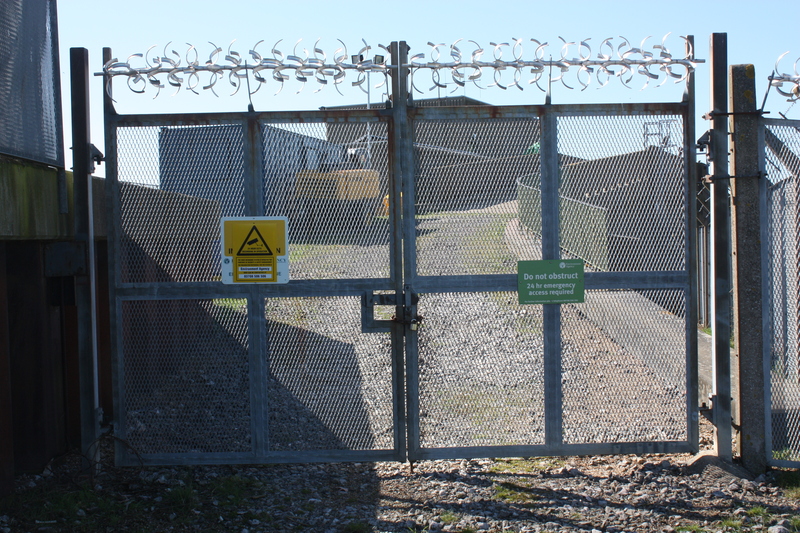 Even real-life showed a track crossing the creek, but unfortunately real-life also showed a big metal gate with a big metal padlock blocking my path. There was no way around the gate. Even though it was low tide there was no way I was going to try crossing the creek. 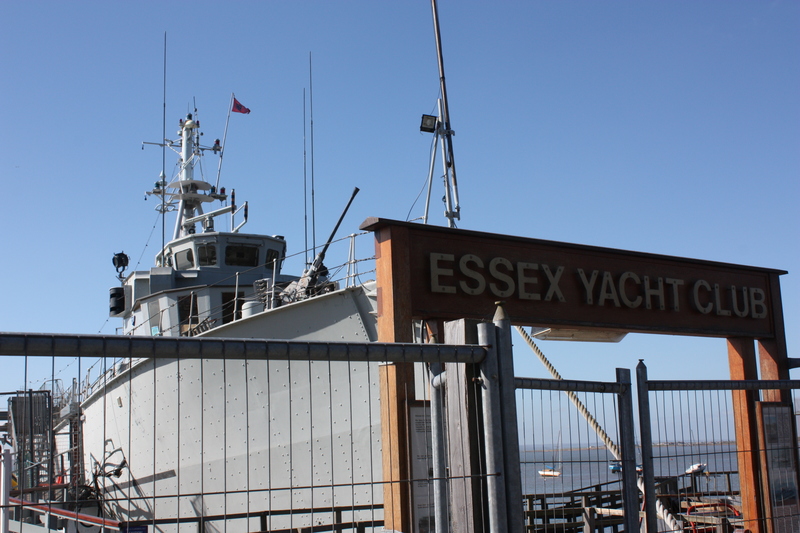 So the only option was to head back to Benfleet, and the only way to get back to Benfleet was to continue around the edge of the island. I was not going to try taking a direct route across the marshes; I have seen how badly that sort of caper can end on the Yorkshire Moors… Unfortunately the walk now became something of a trudge and eventually once again I found myself walking directly towards my starting point on Southend Pier. 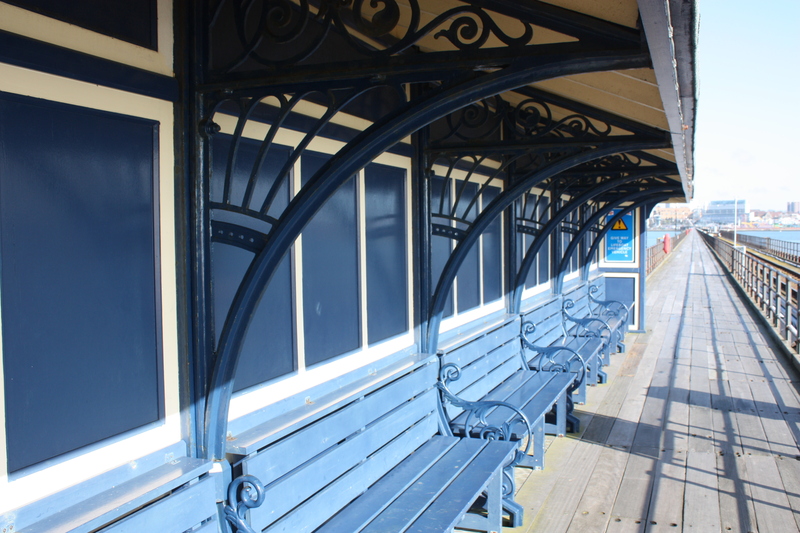 Finally I shuffled onto the platform at Benfleet station for the short ride back to Pitsea. 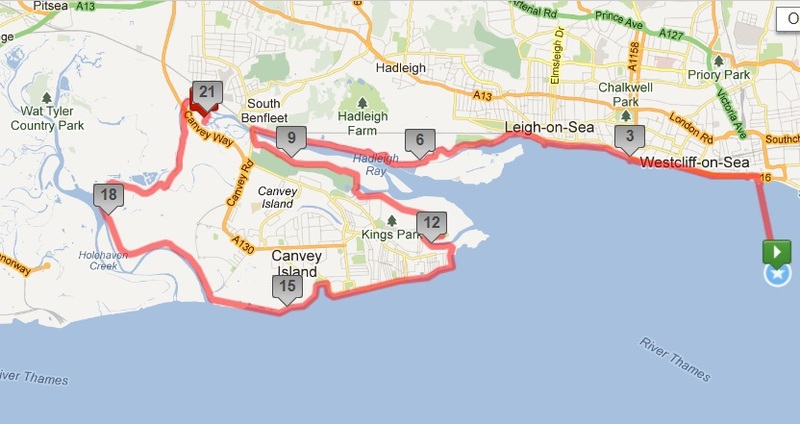 On a positive note, I can now confirm that Canvey is a proper island, surrounded by water and, indeed, flood defences. And that there is only one foot-crossing point to the island, at Benfleet. On a less positive note, this escapade means that the next leg of this journey will have to start with an extra five miles as I have to walk from Pitsea to the other side of the locked barrier and then back to Pitsea as the rules state that the legs must be contiguous. But at least I will get to visit the Wat Tyler Country Park. Injuries: Sunburn. Very pink. SPF30 has now joined the plasters, vaseline and ibuprofen in the medical compartment of my rucksack.